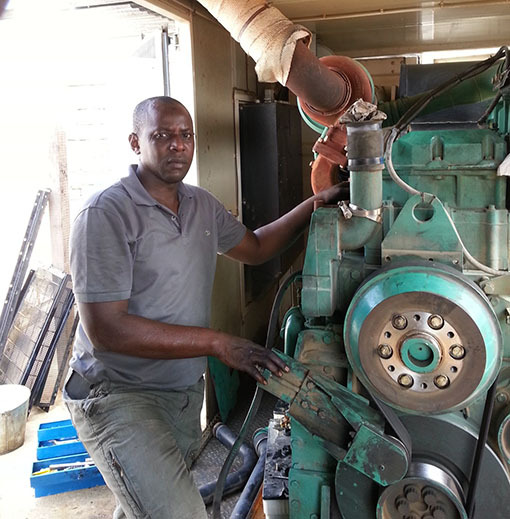 Ba Abdu is a UN Volunteer Generator Mechanic Supervisor with the United Nations Operation in Côte d'Ivoire (UNOCI). He works on maintenance and repair of generator units in different parts of the country. Ba's work contributes to making the mission's mandate possible. Power supply allows for public information to reach the communities, for example, or for people to be able to vote in remote areas. Abidjan, Côte d’Ivoire: I am a UN Volunteer serving as UNV Generator Mechanic Supervisor with the United Nations Operation in Côte d'Ivoire (UNOCI). I am involved in the installation, maintenance and repair of generator units in the Abidjan sector. I also travel to different sectors to assist my generator mechanic colleagues in the repair of generator units. I am glad to see that my work contributes to making the missions mandate possible. During a public information event that was organized by UNOCIs public information section, we were required to provide power so that information could be disseminated and reach the communities. Another example of my work having an impact on the community was during the elections. During that period, we were instructed to go to Aboisso, Adzope and Abengourou to provide power to a precinct so that people in the community could vote. Even though we received the instruction late and we arrived at the site in the evening, we were able to complete our work and connect the generator unit in time. This experience as a UN Volunteer has enabled me to apply my electrical and mechanical engineering skills in a very challenging and stressful peacekeeping work environment. I was able to share my previous experience and competencies, and at the same time further improve on them. I have had the privilege to meet and learn from highly driven, knowledgeable and experienced staff in a peacekeeping mission.